• Changing the face of "PRERANA"
The organization worked with the Government of Ireland's fund, when the devastating earthquake occured in Gujarat. Being satisfied with the commitment of the organization towards the beneficiaries and by the timely completion of the construction project in Bhuj, the Government helped the organization to purchase a building (PRERANA) through Hope Foundation in the year 2003. 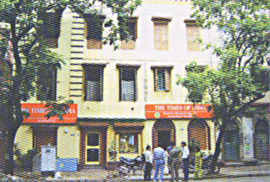 The building is a two storied one, where Vocational Training Center, the City Office and the Short Stay Home for Girls is situated. The building is 35 years old & its present price has gone up by three times when compared to our purchase price. The space has also not been utilised properly, resulting in constant crisis of accomodation. We intend to reconstruct the building, making it a four storied one, where the maximum space will be utilised. As this project will help us to get more space, our objective to rent out the ground floor, will help us to generate the maintenance cost of the building. Strategically we are located in a very prime location of South Kolkata. Our intention is to start construction by 2011. We want to gather a basket full of commitments at this stage, which by the end of 2009 would help as to accumulate the required funds. Lifestyle of the average Indian has been changing, since, not only India but the world is going through a radical change in terms of socio-economic revolution. This revolution has not only created a time crunch but also has converted the homes into "busy homes'. The elderly persons, who live at the other end of the age spectrum, also need special and professional care. As the life span of an individual increases in the industrialized countries, people now can live well into their eigth decade. Unfortunately, they often find that they can no longer take care of themselves. Some of these elderly people have no children or surviving spouse. They may be alone or have no family of their own to take care of them. In many cases, the family of the aged, for a variety of reasons may no longer be able to provide them with the special and professional attention they need. Keeping this problem statement in mind, PBKOJP wishes to come up with a "RETIREMENT RETREAT" which will serve as a safe haven for these loving but unwanted senior citizens. One retreat will be a unique one, where nursing will be the most prioritised segment of all the services offered, in addition to shelter, food & clothing. A vegetable garden will be initiated along with other agricultural activities, which will suit the elders & keep them engaged. This will also act as an alternative source of income, which if need arises will sustain a part of the institution. The necessity for extending a helping hand even after fulfilling the basic need of imparting formal education and providing a shelter has been realized due to the severe competitive world outside the protection homes. The intensity of the pressure to do well in the respective careers to be able to live a comfortable life is enormous. Hence the children who are being brought up in the protection home would certainly need a strong support system to help them realize their dreams of pursuing a higher education and making a career out of it. The main aim of the after care unit would be to encourage and financially support children shifted from the protection home to pursue higher education in colleges and universities. In addition to this the children would be assisted in rehabilitating them by helping these children secure suitable jobs. The team of the after care would function like a human resources unit by keeping liaison with different organizations including corporate organization. This would help facilitate the mainstreaming of the children as well as help them in being economically independent.